The Little Sticks are easily the most delicate, easy-to-wear, and lightest on your ears of all of our designs. Because they are elegantly simple, they're also the most difficult to make: everything has to match....and you'll love the job we do with these! 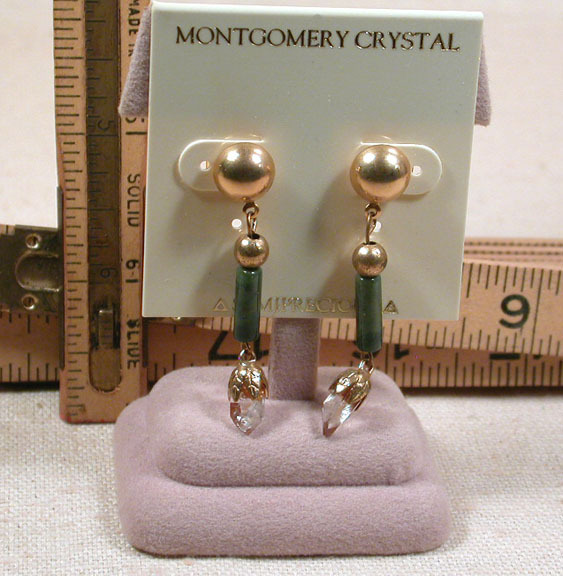 1 -3/4" from the half-ball post to tip, these are heavy 14k goldplate with surgical steel posts, moss agate beautifully and naturally colored, natural Arkansas rock crystals and gold plated beads. You may also have these in your choice of: rose quartz tubes, peach stone tubes, african turquoise tubes, hematite tubes, blue dumortierite tubes, amethyst tubes, chartreuse limon jade tubes, celadon new jade tubes, goldstone [glass] tubes, snowflake obsidian tubes, or taupe antique soochow jade tubes.....email us!